This product contains 4 different assessments that you can give to students to check their understanding of Black Swan Green. 1) The multiple choice quiz is a comprehension-based quiz for plot elements in the first seven chapters of the novel. 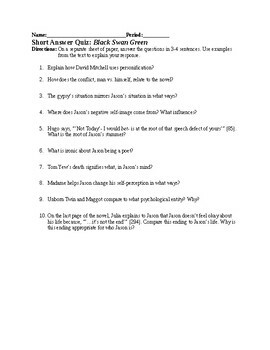 2)The short answer quiz requires students to explain their understanding of the novel in 3-4 sentences. 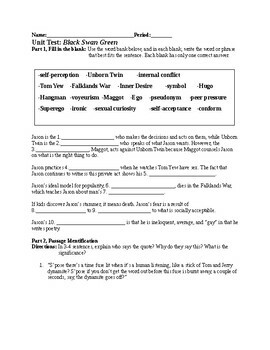 3) The unit test includes fill-in-the-blank, passage identification, and short answer responses, and an essay response. 4) The project hand-out functions as a performance task for students to have options to active showcase how they can use the information from the novel.